P2P group has released an updated version of “Online KMS Activation Script”. 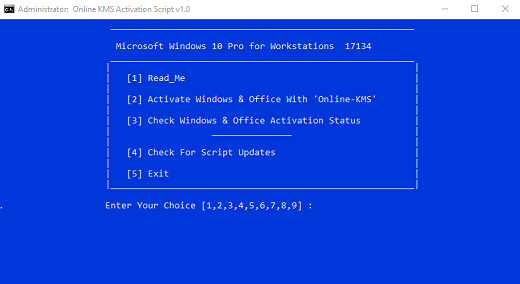 Description: Online KMS Activation Script.cmd Activate Windows & Office for 180 Days with online KMS Servers. This script does not install any files in your system and it clears all the leftovers including kms server name after the Activation. For Successful Activation, Internet Must be connected. Script will skip activation for any products if found permanently activated. For most Windows products, activation period will be for 180 days but for few products it is 30 and 45 days etc. I did not create activation renewal task because some av’s are detecting background renewal scheduled task. If you want your system to be clean from False Positives, then you should use this script to activate and when Licence is about to expire (in 6 months) then reactivate your systemwith this script. I’ve added 17 working servers list in this script,and thats more than plenty and script will auto search and select the working server.you will not face any problem because the lack of working servers. This script (kms) will activate the VL Office, Not the retail(C2R) office. Added Renewal task For Life time activation. $OEM$ Folder is available for Preactivation. Script will now check for updates if online when you open it. Powershell method to detect working kms server have been replaced with cmd fail and try method to remove av’s alert. Now kms server name will not remove after activation, to remove server name from system, use complete uninstall option.